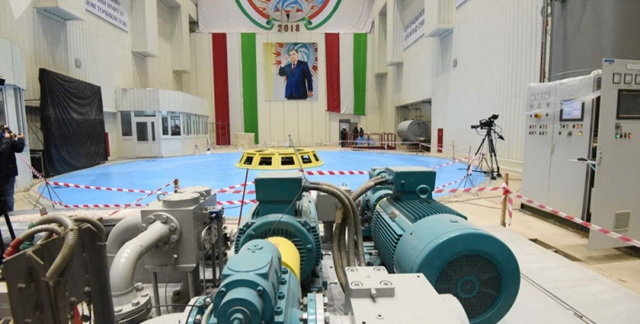 A magnificent show “Father of the Nation Turning on Lights to End Years of Darkness” was staged in Tajikistan on November 16 as President Emomali Rakhmon “launched” a model of the Rogun Hydropower Plant manufactured at 1/5 of its planned size. So far 40-year long construction process, restarted in 2016 with the World Bank’s blessing (but without its funding), contributed to further impoverishment of Tajik people, rising the country’s debt to GDP ratio at one of highest levels in its recent history. Several years ago the government forced citizens to buy bonds to support dam construction. More recently it issued Eurobonds for USD 500 million and sold part of gold reserves to spend up to USD 1 billion on the project between 2016 and 2018. Those expenditures have been non-transparent and results quite modest. Yesterday guests witnessed launch of the first “temporary” 390 MW turbine (to be replaced at unknown date), while the dam on the Vakhsh river in the Pamir mountains was just 75 meters tall (or 22% of its planned size). It is said that by complete filling of reservoir planned in 2033, it will rise to 335 meters and will have six turbines with installed capacity of 3,600 megawatts (MW). At present stage of reservoir filling the temporary turbine at its best may produce 120 MW (or less than 4% of planned capacity). It is promised that starting the turbines gradually before the dam’s completion will help finance construction. Tajikistan’s Finance Ministry estimates the project will require $4 billion more to complete the project. A least for the time being this sounds as wishful thinking. In near future this colossus will not produce any significant amounts of electricity for sale and is even unlikely to significantly ease domestic power deficit. As a matter of fact, by last winter management of Tajik power system was improved so that the first time in two decades people did not experience severe rationing and blackouts. However, in recent months power rationing is back again and prices go up, which is partly attributed to “necessity” to hold the launch ceremony for Rogun without delay on the “President’s Day”-new national holiday in Tajikistan. Sources from which President of Tajikistan may finance continuation of this new pyramid construction are highly uncertain and its price tag will inevitably rise with time. On average large hydropower projects experience cost overrun of 100% and at least 50-70% delay in project completion projected at the time of final project design and investment contract signing. Overruns are higher in countries with weak institutions and low transparency of transactions. Given all that the Rogun project at the time of completion may cost 8-10 billion USD and projected time of completion may extend well beyond 2040. And during all this period Tajikistan economy will be stranded by enormous additional debts, which are actually unnecessary for achieving quality development. If successful in undertaking of completing the Rogun, Tajikistan by 2040 will reach situation of today’s Kingdom of Bhutan, which successfully generates up to 80% of export revenue from hydropower exports to India and remains among low-income countries. Last month new prime-minister of Bhutan declared that his government’s highest priority is achieving more balanced economy and diversified trade to stop overreliance on a single commodity-hydropower energy. Observers also warn that Tajik authorities do not appear to concern themselves with the environmental sensitivities of Rogun, given Rahmon’s obsession with it. First of all, Rogun is located “in a highly seismic area and several geological studies have warned about the risks of building such a large dam in this setting,” Filippo Menga, a lecturer in human geography at the University of Reading in the United Kingdom, told AFP. Secondly, new reservoir with live volume of 10 cubic kilometers may seriously disrupt seasonal flow pattern in Amu-Darya River\Aral Sea basin and cause considerable hardships both for local agricultural users and fragile ecosystems. Uzbekistan, which lies downstream, previously voiced concerns about the impact on the water flows to Uzbek farmers. But Uzbek President Shavkat Mirziyoyev, who took power after Islam Karimov died in 2016, has softened Tashkent’s stance and eased tensions. If, following many political commentators, one assumes that the main goal of Uzbekistan in opposing Rogun was to contain the economic rise of the neighbor, then it is clear why now one may support further development of the Rogun hydro to attain the same objective. Country’s economy may sink under the burden of this hydropower project. Hardships and losses for Tajikistan people and economy induced by Rogun Hydro construction have just started and it will severely limit ability of the country to follow sustainable development path. There have been calls by public figures to rename the dam after President Rakhmon. Saidjafar Usmonzoda, chairman of the Democratic Party of Tajikistan which is represented in parliament, told AFP such a tribute would only be fitting given Rakhmon’s "heroic accomplishment" making Rogun a reality.